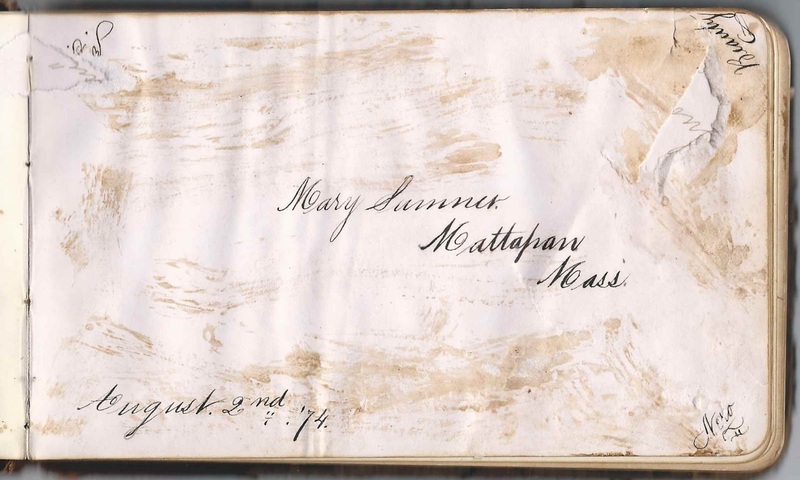 1870s autograph album of Mary Ellen Sumner of Mattapan, Massachusetts. 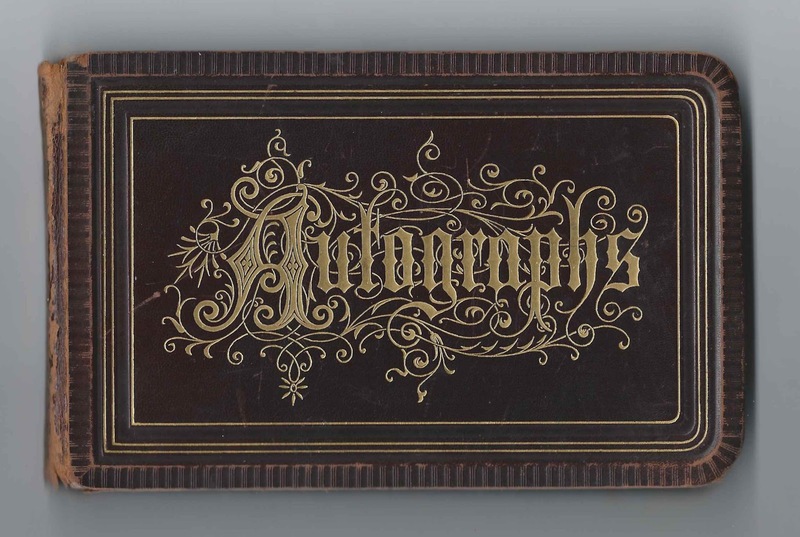 This album was found with another autograph album compiled by Mary Ellen Sumner in the 1870s and with the album of Mary Ellen's daughter, Pauline Sumner Howard, with sentiments collected at home at Mattapan and at college. 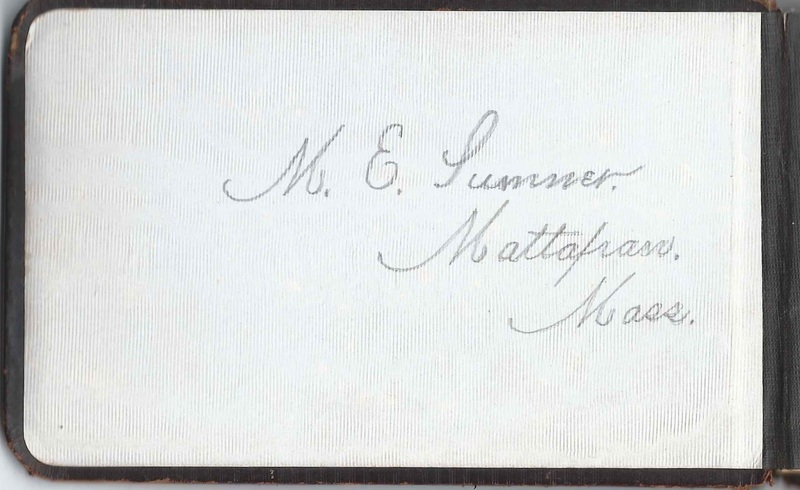 I'm not sure if the Mary Sumner of Mattapan, Massachusetts, who signed a page on August 2, 1874, was Mary Ellen Sumner, or another Mary Sumner, but she signed the page just after the title page. As you can see from the traces of glue on the page below, several of the pages were stuck together. The album measures approximately 6-1/2" x 4" and contains the sentiments of nearly forty of Mary Ellen's relatives, friends and schoolmates. An alphabetical list of the signers appears at the end of this post. Mary Ellen Sumner was born 2 August 1863 at Brookline, Massachusetts, the daughter of Ebenezer and Laura Ann (Hopkins) Sumner, who were born at Sharon, Massachusetts, and Brewster, Massachusetts, respectively. Her mother, Laura Ann (Hopkins) Sumner signed a page in Mary Ellen's other album, as did Laura's brother Warren Henry Hopkins of Orleans, Massachusetts. On 22 December 1881 at Boston, Massachusetts, Mary Ellen Sumner married Frederic Theodore Howard, son of Daniel J. and Almira Eliza (Hood) Howard. Frederic was born 9 January 1859 at Boston, Massachusetts. 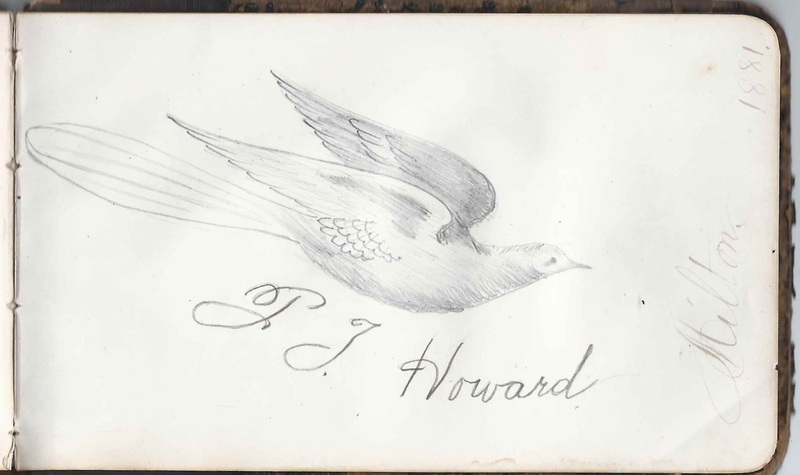 Interestingly, there was an F. T. Howard who signed one of the last pages in Mary Ellen's album at Milton, Massachusetts, in 1881, and sketched a bird. Perhaps this was Frederick Theodore Howard, who signed either before or after their marriage. Mary Ellen (Sumner) Howard and Frederick Theodore Howard would have a daughter, Pauline Sumner Howard, whose autograph album was found with the two albums of her mother. Another fancy sketch was done by signer ? 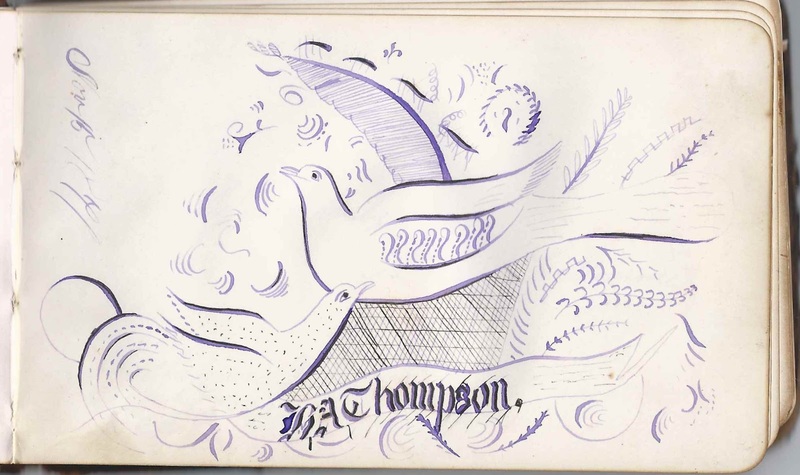 A. Thompson, who sketched a two birds on November 15, 1871. 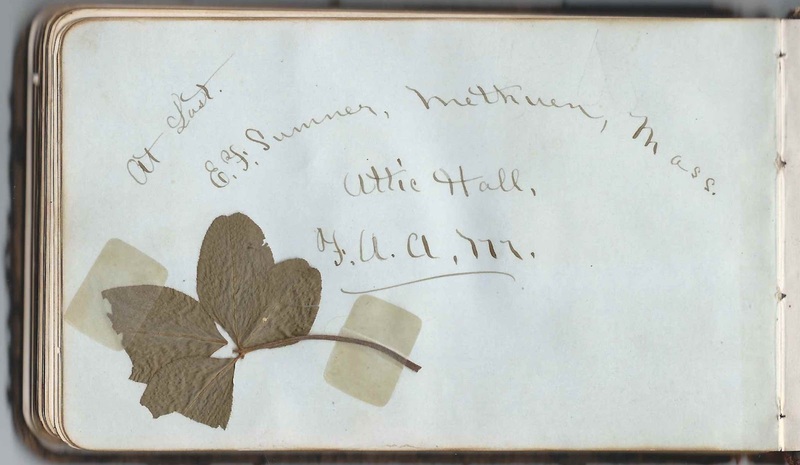 The last page in the album, signed by E. F. Sumner of Methuen, Massachusetts, had a four-leaf-clover pasted on the page. Other signers with the surname of Hopkins or Sumner signed pages in Mary Ellen's album; refer to the list of signers below. George H. Allen of Mattapan, Massachusetts, signed on November 14, 1878 at T.G.S. 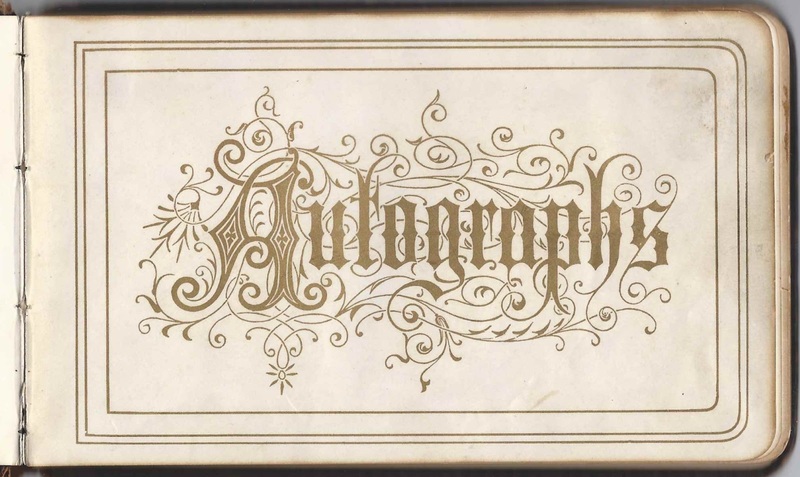 Byron A. Atkinson, signed at Boston, Massachusetts, on February 3, 1878; presumably the B. A. A. who signed the left facing page.
? Clifford Atkinson, signed at Mattapan, Massachusetts, on March 31, 1878. First initial possibly I or J.
Mrs. ? C. Atkinson and Clara Atkinson, signed at Mattapan, Massachusetts, on April 6, 1878. Mentions Sackville, New Brunswick. Perhaps the wife of J. Clifford Atkinson? J. Henry Clark of Mattapan, Massachusetts, signed on January 3, 1878 at T.G.S. James F. Daley of Mattapan, Massachusetts, signed on February 20, 1877, at T.G.S. James A. Irving of Mattapan, Massachusetts, signed on November 14, 1877 at T.G.S. Mary A. O'Hern of Mattapan, Massachusetts, signed on November 14, 1877 at T.G.S. Blanche A. Oldham of Mattapan, Massachusetts, signed on February 22, 1877; signed at T.G.S. C. H. Shattuck of Orleans, Massachusetts, signed on October 28, 1879 "left Home 26th Oct."
E. F. Sumner of Methuen, Massachusetts, signed at Attic Hall, F.A.A. James Thompson of Mattapan, Massachusetts, signed on January 3, 1878 at T.G.S. Very nice Pam. I was interested because I've got a lot of Sumners, but not this person. Also, loved the map...it helped because I didn't know where Mattapan was!